Because of this focus, in addition to going after people on Nixon’s “enemies list,” the Special Service Staff also targeted war tax resisters — under its mandate to “coordinate activities in all Compliance Divisions involving ideological, militant, subversive, radical, and similar type organizations.” The group would come to track 8,585 individuals and 2,873 organizations — and about 800 of these involved war tax resisters. …except for 230 cases relating primarily to war tax resisters, no field referrals were made from SSS files after August 9, 1973 . At the end of November, 1971 , the Washington Post carried an article on war tax resisters. memoranda in the SSS files indicate that this article came to the attention of Commissioner Johnnie M. Walters. These memoranda also indicate that Mr. Walters was concerned about tax resisters, and his concern was communicated to the IRS employees charged with tax compliance. Memoranda in the SSS files indicate that the SSS participated in drafting a report on tax resisters (dated December 30, 1971 ) to the Commissioner from the Acting Assistant Commissioner (Compliance) John F. Hanlon. Mr. Walters returned this report with comments directing increased IRS action in this area. Thereafter, the SSS apparently intensified its activity dealing with war tax resisters. The SSS also received names of tax resisters from other units in the IRS. IRS Service Centers sent the SSS the names of tax protesters who had come to their attention because of information on returns filed with the Service Centers or letters of tax protest received by the Service Centers. Additional names and information were referred to the SSS by other IRS offices (including letters from the public complaining about the attitudes and activities of the tax resisters). A third major source was FBI reports. As noted above, the SSS received a number of FBI reports on tax resistance individuals and organizations, and also received a list of underground newspapers. The staff examined a 10-percent random sample of the SSS files on this first group of war tax resister field referrals. The sample included 27 individuals and 6 organizations. The reports from the field included in the SSS files examined by the staff indicate that the referral resulted in field activity in a minority of the cases and that the field activity was by the Audit or Collection Divisions, with no indication that any Intelligence Division action occurred. The staff examination indicates that some of these field referrals were made without previous analysis to see if there was likelihood of a tax violation. The SSS files on one of the cases referred to the field contained no evidence that the SSS had obtained and reviewed tax information (such as an Individual Master File printout) to determine whether the taxpayer may have failed to comply with the tax laws. In another case the Individual Master File printout showed that tax returns had been filed for all prior years with no balances owed; on this printout an SSS employee had noted that there was no basis for audit action. However, approximately one month later this case was referred to the field. Not all of the cases in the first group of referrals involved “war” tax resisters. One organization referred to the field was a tax protest group generally classified as an “extremist White racist” group; there was no indication that this group was anti-war. Similarly, another case involved an individual who opposed the progressive income tax rate structure, and there was no indication this individual was anti-war. Second group of field referrals. — The second group of field referrals was sent out on December 20, 1973 , using a different form of transmittal memorandum than was used with the first group. The transmittal memorandum for these referrals was entitled “Information Items” and the District Directors were advised that the attached materials were forwarded for their information and for whatever action they “deem appropriate.” The memorandum also advised that it was not necessary to report any action taken, as was required with the earlier group of referrals. (Apparently no reply was requested because the SSS had been terminated.) Finally, there was attached a list of the individuals and organizations with their tax filing history, if this information was available. IRS concern generally with the failure to pay Federal taxes as a war protest had developed much earlier. For example, the Internal Revenue Manual contained guidelines for the handling of war tax resistance cases as early as 1968 . 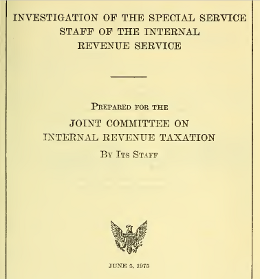 The guidelines originally pertained to failures to pay Federal income taxes, but by 1970 they also included telephone and transportation excise taxes. According to a January 1, 1972 , memorandum from Paul Wright to the Director of the Collection Division, the SSS considered that underground newspapers were important to the examination of the war tax resister group because they acted as a “conduit for their movement,” and contained numerous articles on how to file false returns and otherwise confuse IRS operations. “Underground newspaper” was defined to include newspapers of anti-establishment orientation which advocated violent or subversive means to achieve their ends. According to the IRS, the SSS had files on 148 underground newspapers. The staff examination of administrative files and the other field referrals indicates that prior to March of 1972 , there were several referrals of cases which could be classified as war tax resisters. A number of underground newspapers were also referred to the field under regular field referral procedures. The SSS also several times sent information concerning war tax resisters to field offices on an informal basis. The SSS was so tainted by Nixon’s use of it that the IRS Commissioner told Congress that after it completed its investigations, he would try to have its files destroyed. This also made it difficult for the IRS to use information gathered by the SSS in its ongoing actions against war tax resisters. So some such actions were abandoned in mid-stream: Notably, the seizure and sale of Ernest and Marion Bromley’s home. In 1975 , after the IRS had already seized and auctioned off the house, the agency (under sustained pressure from the Peacemakers and their supporters) backed off, canceled the sale, and dropped its enforcement actions against the Bromleys and the Peacemaker movement (see The Picket Line 31 January 2008 ).